When Filter Bar is activated on your site, the various filters each have their own title. The Events Category filter, for example, has a default title of Events Category. The titles are generated programmatically, so at this time you cannot fix the above issue with the translation files. You can, however, fix the issue by overriding the title text completely in your Settings. In your site's wp-admin, head to Events → Settings → Filters. In the list of filters, find the filter whose title is not appearing how you would like (e.g. Category). Expand the filter so that some options related to it expand, as shown in the image below. 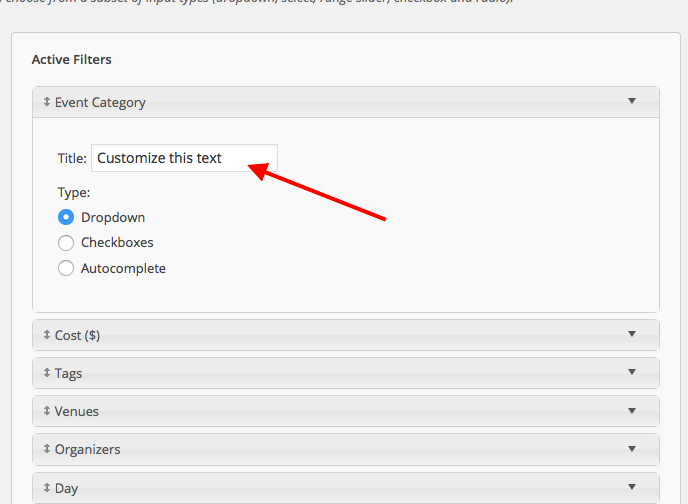 Customize the title text so that it is in the language of your site. See below for a screenshot of where to customize this. Save your changes, and you're all set! An example of the customizable "Title" field for Filter Bar filters.